Staff at Brussels Airlines� offices in Rwenzori House were delighted when news broke that the Uganda Tourism Board informed them of their nomination in the category of best airline flying out of Uganda and invited them to provide the panel with details on media coverage, releases, CSR activities, and general support for the tourism industry. Needless to say, the airline was able to provide all of that and more, with many articles in fact attributed to this correspondent and published in the international media. In 2014, Brussels Airlines was the official airline for the Africa Travel Association Congress in Kampala, and would have been again for 2015 when the just-ended congress was held in Nairobi, but for a route switch with senior partner Lufthansa which saw the airline commence flights to Accra while leaving the Kenyan capital to Lufthansa. Regular reduced fare offers for Ugandan tourism stakeholders when traveling to the main international trade shows in Berlin and London are also part of the airline�s commitment towards Uganda as was the sponsorship last year of the country�s first Paramotor Tour which produced an overview of the country from an unusual perspective. Makerere University�s Academic Excellence Awards were as much supported as was the tourism board a beneficiary of the airline�s support. 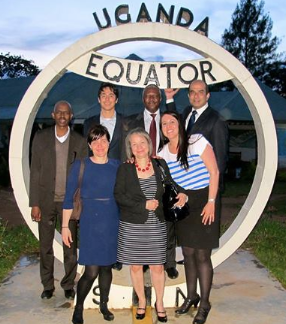 The awards will be announced during a gala evening at the Kampala Serena Hotel as part of the Pearl of Africa Tourism Expo 2015 which will launch in a few days and has seen a large number of hosted buyers invited to the country, presently touring the national parks and exploring the scenic spots the country has to offer. The Pearl of Africa Tourism Expo is an annual event in the East African region organized by Uganda Tourism Board (UTB) that brings together travel agents, tour operators, hoteliers, destination managers and other service providers along the tourism value chain. It is a unique opportunity for the tourism business operators to meet new clients, network, and market and discuss business. The Pearl of Africa Tourism Expo in its second year of organization is one of the favorable Exhibitions in the Tourism industry aimed at raising the profile of Destination Uganda both Domestically and Regionally. It is becoming an important platform for Tourism networking and Business transactions. the regional tourism boards who have been invited. It is forecasted that there will be increased interest inthe Expo from around the globe this year. companies that already sell Uganda, those that are keen on increasing their product range, and those whom we need to reassure and instill confidence in the destination in order to continue promoting the destination to the consumers. 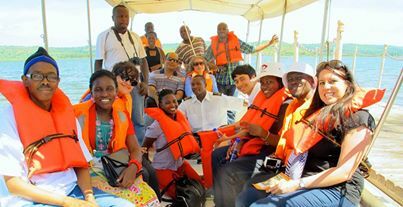 ATA UGANDA CONGRESS: Magical day sailing along the source of the White Nile and walking through the rainforest with the Ministry of Tourism, Wildlife and Antiquities-Uganda,Uganda Tourism Board, Uganda Wildlife Authority. #ATAUganda � at Jinja Source of the Nile. Thank you for the interest you have shown in visiting our country. We believe you will find we can offer something very special to a special kind of visitor one who recognizes the value of an authentic African experience, and the value tourism itself can bring to an emerging country such as ours. Uganda has a rich tourism history, indeed we were one of the very first popular destinations on the entire continent of Africa. In 1907 we were visited by no less than Winston Churchill. His discriminating and perceptive analysis of what Uganda has to offer was recorded in "My African Journey", where he wrote "Uganda is truly the pearl of Africa". Uganda has lost none of its beauty, its magic, or its people's well-earned reputation for hospitality, modesty and friendliness. With the trials of independence and civil war now long past, Uganda has once again opened its doors to tourists. Over the past three years there has been much work done here by The Ministry of Tourism, through its associated agencies the Uganda Tourist Board and the Uganda Wildlife Authority, to sow the seeds of a brand new conservation-based form of sustainable tourism. This innovative programme has benefited greatly from the invaluable support of the European Union, USAID and the World Bank. The involvement of these donors has attracted other partners too in what promises to be a powerful and effective collaboration. This partnership pattern is, in fact, demonstrated at all levels of our tourism development programme. Mutually beneficial relationships have been struck, between communities and protected areas, donors and government, wildlife and people. The dialogue and relationships thus formed are helping us to reconcile economics with ecology, visitor impact with sustainability, pragmatism with vision. The key elements of our young yet vigorous programme are: product definition; capacity building; training, conservation education, nature-based resource consolidation, sustainable use, stakeholder consultation and coordination. A host of participants, from the children of the villages right up to the highest levels of national government, have joined together to learn and to create something which offers a brighter future for all. And what does all this mean for you, our guest, the vital, final piece in the stakeholder jigsaw? On the carefully-designed Uganda Trails you can expect spectacular landscapes, thrilling white-water rafting on the Nile, awesome African wildlife, including the world's most varied primate populations (did you know that over half the worlds remaining Mountain Gorillas live here?). You can look forward to world-class sport fishing, abundant forests, some of the best bird watching anywhere on Earth and a hearty welcome from some of the most resilient and cheerful people you will ever meet, anywhere! To join ATA, contact ATA Headquarters or join on-line.